The Q3ListViewItem class implements a list view item. 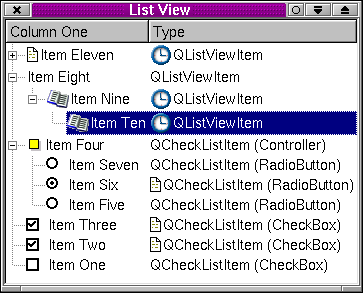 A list view item is a multi-column object capable of displaying itself in a Q3ListView. The easiest way to use Q3ListViewItem is to construct one with a few constant strings, and either a Q3ListView or another Q3ListViewItem as parent. We've discarded the pointers to the items since we can still access them via their parent listView. By default, Q3ListView sorts its items; this can be switched off with Q3ListView::setSorting(-1). The parent must be another Q3ListViewItem or a Q3ListView. If the parent is a Q3ListView, the item becomes a top-level item within that Q3ListView. If the parent is another Q3ListViewItem, the item becomes a child of that list view item. If you keep the pointer, you can set or change the texts using setText(), add pixmaps using setPixmap(), change its mode using setSelectable(), setSelected(), setOpen() and setExpandable(). You'll also be able to change its height using setHeight(), and traverse its sub-items. You don't have to keep the pointer since you can get a pointer to any Q3ListViewItem in a Q3ListView using Q3ListView::selectedItem(), Q3ListView::currentItem(), Q3ListView::firstChild(), Q3ListView::lastItem() and Q3ListView::findItem(). Q3CheckListItems are list view items that have a checkbox or radio button and can be used in place of plain Q3ListViewItems. Note that the order of the children will change when the sorting order changes and is undefined if the items are not visible. You can, however, call enforceSortOrder() at any time; Q3ListView will always call it before it needs to show an item. See also Q3CheckListItem and Q3ListView. Constructs a new top-level list view item in the Q3ListView parent. Constructs an empty list view item that is a child of parent and is after item after in the parent's list of children. Since parent is a Q3ListView the item will be a top-level item. Constructs a new top-level list view item in the Q3ListView parent, with up to eight constant strings, label1, label2, label3, label4, label5, label6, label7 and label8 defining its columns' contents. Constructs a new list view item as a child of the Q3ListViewItem parent with up to eight constant strings, label1, label2, label3, label4, label5, label6, label7 and label8 as columns' contents. Constructs a new list view item in the Q3ListView parent that is included after item after and that has up to eight column texts, label1, label2, label3, label4, label5, label6, label7 andlabel8. Note that the order is changed according to Q3ListViewItem::key() unless the list view's sorting is disabled using Q3ListView::setSorting(-1). Constructs a new list view item as a child of the Q3ListViewItem parent. It is inserted after item after and may contain up to eight strings, label1, label2, label3, label4, label5, label6, label7 and label8 as column entries. Note that the children are not guaranteed to be sorted properly. Q3ListView and Q3ListViewItem try to postpone or avoid sorting to the greatest degree possible, in order to keep the user interface snappy. See also setSelected(), Q3ListView::setSelected(), and Q3ListView::selectionChanged(). See also itemBelow() and Q3ListView::itemRect(). See also itemAbove() and Q3ListView::itemRect(). Returns the y coordinate of this item in the list view's coordinate system. This function is normally much slower than Q3ListView::itemAt(), but it works for all items whereas Q3ListView::itemAt() normally only works for items on the screen. See also Q3ListView::itemAt(), Q3ListView::itemRect(), and Q3ListView::itemPos(). Note that the siblings are not guaranteed to be sorted properly. Q3ListView and Q3ListViewItem try to postpone or avoid sorting to the greatest degree possible, in order to keep the user interface snappy. See also paintCell() and Q3ListView::drawContentsOffset(). The painter is a Q3Painter open on the relevant paint device. It is translated so (0, 0) is the top-left pixel in the cell and width - 1, height() - 1 is the bottom-right pixel in the cell. The other properties of the painter (pen, brush, etc) are undefined. cg is the color group to use. column is the logical column number within the item that is to be painted; 0 is the column which may contain a tree. This function may use Q3ListView::itemMargin() for readability spacing on the left and right sides of data such as text, and should honor isSelected() and Q3ListView::allColumnsShowFocus(). The rectangle to be painted is in an undefined state when this function is called, so you must draw on all the pixels. The painter has the right font on entry. See also paintBranches() and Q3ListView::drawContentsOffset(). See also paintCell(), paintBranches(), and Q3ListView::setAllColumnsShowFocus(). If allow is true, the list view starts a drag (see Q3ListView::dragObject()) when the user presses and moves the mouse on this item. Note that root items are not expandable by the user unless Q3ListView::setRootIsDecorated() is set to true. See also isExpandable() and setSelectable(). This function does not maintain any invariants or repaint anything -- Q3ListView::setSelected() does that. See also isSelected(), height(), and totalHeight(). If the text() function has been reimplemented, this function may be a no-op. If the item is not visible, itemAbove() and itemBelow() will never return this item, although you still can reach it by using e.g. Q3ListViewItemIterator. This virtual function is called before the first time Q3ListView needs to know the height or any other graphical attribute of this object, and whenever the font, GUI style, or colors of the list view change. Removes item from this object's list of children and causes an update of the screen display. The item is not deleted. You should not normally need to call this function because Q3ListViewItem::~Q3ListViewItem() calls it. Returns the text in column column, or an empty string if there is no text in that column. See also setText(), key(), and paintCell(). Returns the number of pixels of width required to draw column c of list view lv, using the metrics fm without cropping. The list view containing this item may use this information depending on the Q3ListView::WidthMode settings for the column. See also listView(), widthChanged(), and Q3ListView::setColumnWidthMode().